The news in our area this week highlighted a very high profile pastor’s separation from his wife following his rehabilitation from an addiction issue. Because he started in this part of our state, I have heard preachers in my presence speak against him, the church he founded, and literally gossip about his struggles. I highly question that they ever stopped to pray. Megachurch pastors are not the enemy. Preachers of other denominations are not the enemy. Preachers at a church other than yours are not the enemy. We must focus on the real enemy who steals, kills, and destroys (John 10:10). He is the one who entices us to gossip, leads people astray through either teaching or believing false doctrine, destroys marriages, and leads us away from humility. We make the choice to give in to the enemy or resist him. The devil cannot make us do anything! I find myself constantly examining if I am talking about something in a group that will devour the information or one that will pray. Are my intentions pure? Because divorce is something I have personally experienced, I want to urge the reader to pray for pastors, their families, and families in general. Let’s not sensationalize someone’s heartbreak or our opinions. It’s time to pray! Prayer has the power to restore. Such a huge difference between the two. Amen, Matthew. 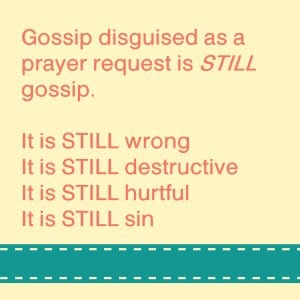 Far too often, we use prayer as an excuse to gossip. We use what we say is compassion to tell the tale of someone going through a hard time, when really all we are doing is gossiping. It’s a blight on the church, and it makes the Lord sad. Ephesians 4:29 is a good verse to live by. It basically says, in a modern persons words, if you can;t say something good about someone, don’t say anything at all! Good Post! Philippians 4:8 is a good verse also. It tells us the things on which to meditate which will be that which comes from our lips. Yes. I did quite a study on that last year. I was blown away when I really studied our that verse. It’s incredible! It was a really good experience, very healing for everyone, but it also opened my eyes to how much suffering and grief the church can cause,how painful gossip can be,what unrealistic standards we sometimes have for pastors and their wives. Such an important thing to remember!